A remarkably prescient political satire. Filmation’s ’60s Batman cartoons will never been confused with the output by Bruce Timm and his crew 25 or so years later. They’re generally simplistic and aimed at an audience that’s decidedly juvenile. With all that in the zeitgeist, veteran cartoon writer Dennis Marks — credited as Denis Marks — scripted a story of corruption and shenanigans disguised as Saturday-morning fare. The episode premiered Nov. 2, 1968, just three days before Nixon defeated Hubert Humphrey at the polls. But watching it nearly 50 years later, there are stark parallels to the 2016 election and the state of things today. 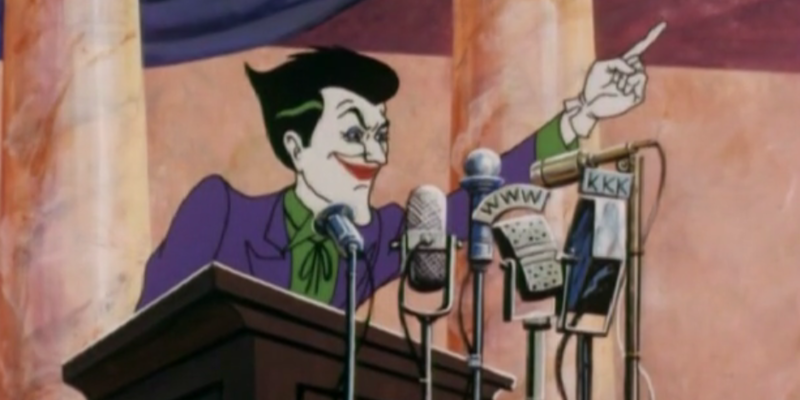 The episode, which has echoes of the 1966 live-action two-parter Hizzoner the Penguin, opens with the Joker planting stolen cash on the mayor then declaring that he wants to run for mayor so that he can Make Gotham Great Again Drain the Swamp take over the city. There’s even a bizarre image where the Joker speaks to the Fake News media and one of the radio station’s call letters is … KKK. And he wins! He rigs the election — bigly — by using electronic devices to hack voting machines. But he’s not done yet: He installs the Penguin as chief magistrate and the Riddler as district attorney. Because it’s always shrewd to name department chiefs whose primary goal is to undo the vital work of their important agencies. So what’s one of the Joker’s first executive orders? He locks ’em up! 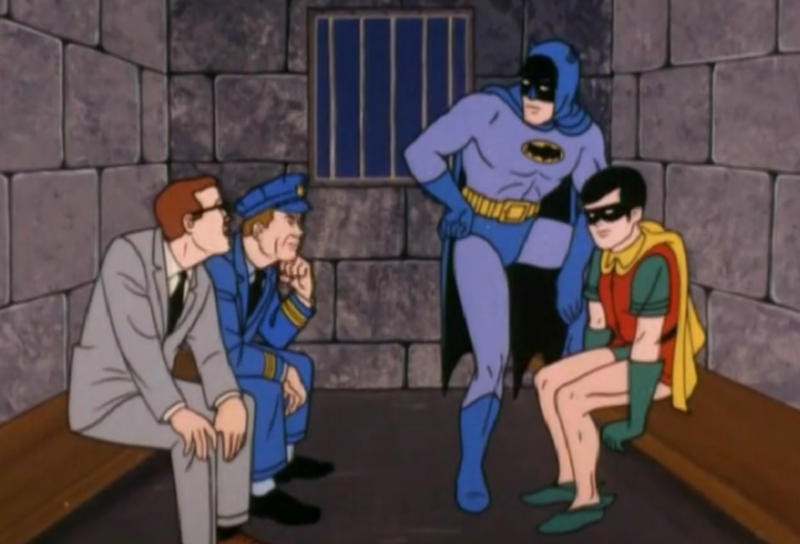 Batman, Robin, Commissioner Gordon and Chief O’Hara get tossed in the clink — the two-parter’s cliffhanger. There’s a lot more to it and you can watch the episode here. Even better, you really should check out the latest Batcave Podcast — click here or get it on iTunes — where John and I put on our Meet the Press hats and go to town. Said it before, and again….early childhood memories. Love these! President Trump is like someone out of a Batman story ! He is not a tipical polittion. Thanks for grate Bat site ! After reading on hear about the fantastic Batman I sent of to the USA for the DVD SO first time I have seen it in almost 50 years !! Interesting that one of the microphones in the frame of the Joker is for station “KKK”. And there is WWW years before the World Wide Web is invented. Wow. Someone comparing a super-villain to Trump. How edgy and original. President Trump is Batman. Particularly Batman in Dark Knight Returns: an aging billionaire who takes on puppet establishment figures to prevent his land from being overrun with criminal mutants. Clinton is Joker. Jeb Bush is the mayor. Ted Cruz is Two Face. Trump Knight Returns. Big League. “power is a corrupting force, Robin. Especially in the hands of crooks.” It’s amazing that a bad cartoon from the 60s can be so correct here in the 10s. There is an Underdog episode where Villain Simon Bar Sinister creates a feather-emitting gun that tickles the victim so much that they cannot use the voting machine. Not as subversive as Filmation’s Batman, but similar. Looking back, I think the 1968 version of Batman was underrated. I love the Penguin episodes written by Bill Keenan.